Over the years we've met in a number of different places - including an Anglican Church and a local charity's HQ (Click on the "Missions" tab above for more about the charity). 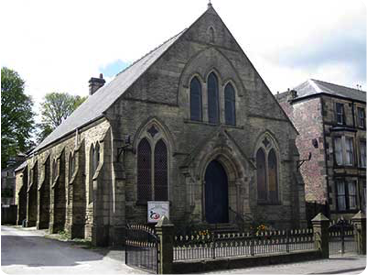 In July 2008, by God's grace, we were able to purchase this lovely 19th century former Methodist Chapel which is where we meet to this day. You're assured a warm welcome at Buxton Community Church. If you live in Buxton or the surrounding area (or even if you are just visiting this lovely part of the world) why not join our Sunday morning worship at 10:30 am? Are you looking for a church where everyone is perfect? Where children remain silent and sit in their seats - as 'good as gold' - all through the service? Where 'regulars' frown at folks who 'dress funny' or have 'strange hairstyles' or tattoos? Then maybe we're not the church for you. You'd be very welcome - of course - but then so is everyone else! You see, we're a church made up of ordinary people. Imperfect people - with every background imaginable. Rather than being a place where people who feel far from God are met with shame, guilt, and condemnation, Jesus leads us to be a family that extends His grace, mercy, and forgiveness to everyone. No matter what you’ve been through or what questions you might have, we want you to be a part of the family. Come, check us out. We don't bite. We're just ordinary folk who love God and do our best to love each other. Come see us on Sunday (shortly before 10:30 so you'll have time to enjoy a cup of tea or coffee and biscuits before the service) or Click on the 'Diary' tab above and choose an event during the week.